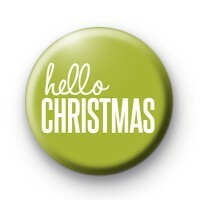 Hello Christmas Badge in green with super festive white writing which reads hello Christmas in a lovely festive font. A contemporary Christmas badge which is perfect to pin to your school blazer or work clothes. Our Xmas badges are really popular each year and we have hundreds of Xmas badge designs to choose from so be sure to browse the Christmas badge category. 25mm badge made by hand in our UK workshop.